There are a few songs that always make me think of Caroline. Sometimes they make me smile, and sometimes they make me cry, but they all are carried in a special place in my heart. Sometimes music is the only way to put your finger on a feeling that you can’t quite describe. This first song was my anthem during Caroline’s pregnancy: Brave by Sara Bareilles. It played on the radio on the way to the hospital and while there, we found her singing it in a concert while flipping through TV channels. I don’t think that was a coincidence. This next song touched me both before and after Caroline was born: Let Her Go by Passenger. I remember hearing it on the radio after getting Caroline’s diagnosis and bursting into tears. I had the same experience a few weeks ago when it was again on the radio. I didn’t want to let her go but I didn’t have a choice. This final song reminds me of the love I have for my daughter: All of Me by John Legend. It usually makes me smile, but occasionally leads to tears. My husband claims that I ruined the song for him because I told him that it reminds me of Caroline and now he cries every time he hears it. I don’t think I ruined it though; I think it’s the perfect love song for our little girl. Categories: Grief | Tags: bereaved parent, child loss, grief, love, music, parents | Permalink. My daughter is such a miracle. She had such an impact on the world in her short time here, but she also taught me and my husband so much about love and miracles. When we found out about her diagnosis, it was crushing. We cried for days, mourning the life we dreamed of living with her. We named her Caroline and decided that we would make every memory with her that we could during the rest of my pregnancy, and we did. I started a journal and made notes about doctor’s appointments as well as what was going on in our lives and how I was feeling, emotionally and physically. We bought the essentials that we needed for the hospital, packed our bags, and waited as we approached full term. Doctors prepared us for the worst. First we didn’t know if she would make it to term. Then we didn’t know if she would be stillborn. Then we didn’t know if we’d have minutes, hours, or days with our daughter. It seemed that the most likely scenario was to go home from the hospital without her. We prayed to have some time with Caroline to show her that we love her, and that she would not suffer. I never prayed for her to be healed. I can’t say exactly why I never did. Perhaps because of my faith in medicine and her doctors. Even more so, perhaps because she was perfect the way she was. I couldn’t ask any more of her than to be the beautiful person she was meant to be. It was a miracle that Caroline was born alive. Her OB cried along beside us, as she didn’t even need any resuscitation. Having minutes with her was another miracle. Having hours with her was yet another miracle. Taking her home from the hospital was another miracle. Having the time at home to care for her and love her and meet more of her family was another miracle. 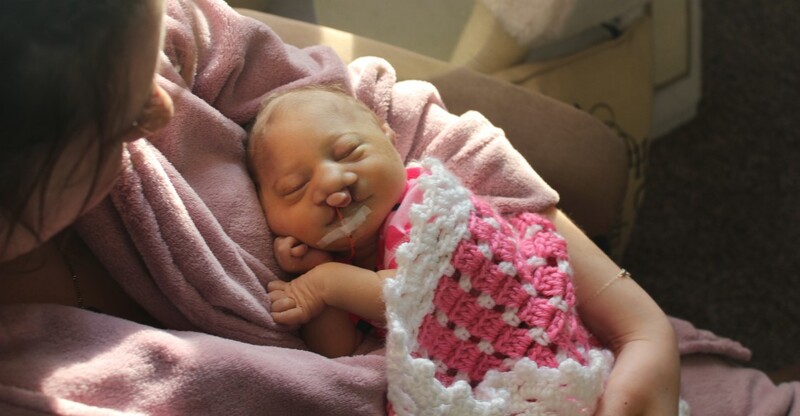 Having both of her parents holding her tight while she passed from this world to the next was another miracle. Caroline had a special message to send to the world. She showed us that life is precious and delicate and should never be taken for granted. She also showed us the beautiful strength she was given to survive well beyond the time predicted with her diagnosis. She made us parents, and showed us the meaning of unconditional love. When my husband first brought Caroline to me after she was born, I remember looking at those big, bright eyes and being amazed by the miracle in my arms. What a miracle it was to be her mother. Every baby is a miracle. Every baby is here for a purpose, and every baby matters, even if the only life they knew was that in their mother’s womb. Being Caroline’s mom has been the most difficult experience of my life, but more importantly, the greatest joy I have ever known. Categories: Trisomy 13 | Tags: bereaved parent, heaven, home, inspiration, love, miracle, mother, parents, trisomy, trisomy 13 | Permalink. They say that men and women grieve differently. I think a more accurate way to put it would be that people grieve differently. I am thankful that my husband and I have been able to support each other through our grief, regardless of that fact. As couples become more similar to each other as they get to know each other, we have taken a similar journey with our grief. We started so differently but now we cope in very similar ways. Before Caroline was born, we dealt very differently with her diagnosis. I needed to be prepared in every way. I scoured the internet for family stories and research articles about survival and quality of life. I made her a purple and green tulle tutu with purple flowers for pictures if she was very premature. I ordered a pink ruffled romper with a pink flowered headband for pictures if she was born closer to term. When I made and bought these outfits, I thought that they would likely be the only outfits that she would ever wear. Even so, I bought a few extra outfits in preemie and newborn sizes, just in case. I made and gathered books to read to her. I made sure we had blankets, booties, and mittens. I got special paper for ink footprints and handprints. I made a chalkboard for pictures that might not ever be used. I called the funeral home to make an appointment. This is the way that I grieved – I did my best to prepare myself for every possible outcome. I wanted so badly to have some time to love on her and get to know her, but I had to prepare myself for the worst. My husband grieved very differently. He couldn’t shop for Caroline. I couldn’t leave my journal out, because if I did he would try to read it and about a sentence in, would burst into tears. “How do you write this without crying?” he would say. I honestly didn’t know, but my journal was my outlet. As I wrote about Caroline’s appointments and documented my pregnancy, it put my mind at ease that I would never forget my time with her. To my husband, the writing seemed an exercise in masochism. His approach was to just not talk about the fact that he may never meet his daughter, and although I didn’t understand it, it was okay. It was his way of processing the unprocessible. I remember when Caroline was born, and we were able to TAKE HER HOME, seeing how happy my husband was. It was startling. I don’t think I realized how miserable he was before until I saw how happy he was to spend time with Caroline. When he went back to work, he would come home almost every day with a new outfit for her to wear. He knew that we would have to say goodbye someday soon, but he was the happiest I had ever seen him. I was happy too. Looking back at pictures, we both glow in every single one. When our daughter went to heaven, our grief became more similar. We both cried often for the first week or so, but then it lessened. We both talk about Caroline all the time. My husband has told me that he’s so glad that I kept a journal. He had me put excerpts from it in a baby book that I made for her. I have bad days and he has bad days. Most of the time, they fall on different days so that we can take turns being the comforter and comforted. Other times, we have bad days together and cry together, holding each other close. I don’t know how I would get through this without him and am so glad that he hasn’t reacted by wanting to pretend that she didn’t exist. He acknowledges her every day and is as proud as I am to have her pictures hanging throughout our home. The grief of losing a child is certainly life-changing enough to have the capability of putting immense strain on a marriage. I am happy to say that my spouse and I are closer than we have ever been. We lean on each other and support each other, loving our daughter Caroline every second of every day. Categories: Grief | Tags: angel, grief, journal, love, memories, parents, support | Permalink. I never knew silence could be so loud. I walk in the door and the absence of sound is deafening. For two months, our family shared in the joys and frustrations of caring for an infant. There was always something to do; she needed to be fed, or rocked, or bounced, or held tight. We were sleep deprived and loving every minute of it. We took a picture of Caroline with a chalkboard every day, documenting how many days old she was. Now the chalkboard is in a closet somewhere and there are no more updates. We were blessed to spend 58 days with her, but of course it is never enough. Why did our sweet child have to go so soon? Now, the only thing that we can do at home is go online or watch TV. The familiar baby sounds are gone and we are bored and empty. I miss our family unit of 3. I miss my sweet Caroline. Categories: Grief | Tags: bereaved parent, chalkboard, child loss, empty arms, grief, home, love, parents, silence | Permalink. This week has been hard. I’ve had that pressure on your chest that won’t let up, no matter what you do. The past few nights I have been very glad to have our Caroline bunny to hold tight in my arms. A few days after Caroline died was our second wedding anniversary and what would have been her two-month birthday. My husband and I took a trip into the city to accomplish a few goals. Unfortunately, one was to buy a dress and a suit for her funeral. The other goal was to go to one of those bear building stores. My husband had talked about going there to build one for Caroline before she passed away, and it felt right to still do it for her. We brought sunglasses to wear if we needed them, but we made it through without any tears. We chose a bunny with a pattern of multicolored flowers on the fur. Flowers are something that we associate with Caroline, and she had a musical bunny that she loved, so it was perfect. We each picked out a heart for the bunny, and went through all the steps of putting it together. We named the bunny Caroline. The most difficult part was checking out – the cashier asked us how old our daughter was. We didn’t have the heart to tell her the whole story, so we told her that she was 2 months old, and the cashier responded that it’s a fun age. That stung, but what could we expect her to say when we kept our secret? We built Caroline bunny for our daughter, but it has helped us through our grief instead. Holding something in your arms is sometimes the only thing that helps when you miss your daughter more than words can say. I like to think that Caroline smiles when her bunny comforts her parents. Categories: Grief | Tags: angel, empty arms, grief, love, memories, parents | Permalink.